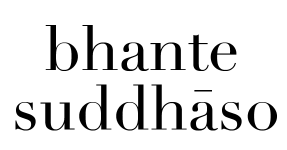 Bhante Suddhāso’s work is aimed at providing the public with free access to the Buddha’s teachings, as preserved in the Pāli Canon of Theravāda Buddhism. All translations on this site are by Suddhāso Bhikkhu and are sourced directly from the original Pāli texts. They may be freely distributed as long as the translator is credited for his work. If you wish to support his teachings and Dhamma activities, you may donate to his organization, Buddhist Insights, using PayPal.